Upgrading your PlayStation 4 couldn't be easier! 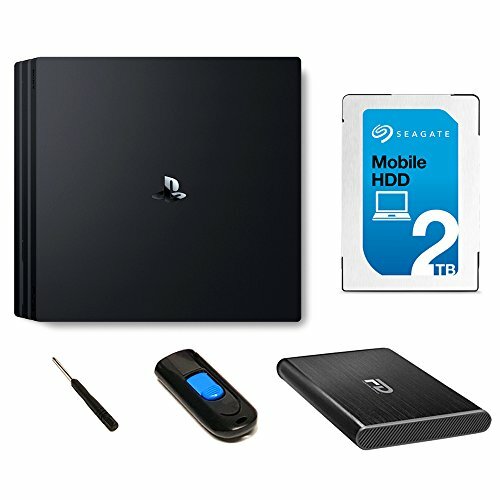 We provide all the essentials you need on how to backup files, installing the new components, and re-using the original hard drive by converting your PlayStation 4's original drive into a new external portable drive with our included Fantom Drives G-Force portable USB 3.0 aluminum enclosure. Our quick start installation guide provides everything from preparing, removing, installing, and updating your PlayStation 4 to NEXT level of gaming. By upgrading to a 2TB hard drive, it enables users to download more games, store more data, and an increase of performance. This Product also works with PlayStation 3! Package Content: 2TB 2.5 inch Hard Drive, 32GB Flash drive, Fantom Drives G-Force portable USB 3.0 aluminum external enclosure, carrying pouch, Philips screwdriver, micro USB 3.0 cable, quick start installation guide. Convert PS4's original hard drive into an external HDD to use with any USB 2.0/3.0 computer. The external hard drive can also be used as an portable game drive for PS4.